Describing the Championship as ‘the most exciting league in the world’ is as misleading as calling the Premier League ‘the best league in the world’. The Championship is competitive and it’s close, but that’s different to saying it’s exciting or entertaining. I’m pleased that Bournemouth and Watford secured the automatic promotion places as they have played the most attractive football. But as much as I’d love to see Lee Tomlin playing Premier League football, I’d hate to see Middlesbrough on Match of the Day next season. Outside of Chelsea under Jose Mourinho, I haven’t seen a more boring, graceless display this season than Boro’s when they won 1-0 at Norwich City recently. No shock that Boro manager Aitor Karanka is a Mourinho disciple. But in reality all these promoted teams have achieved is the right to make a few million in TV money and some lovely awaydays as they will be coming straight back down. Bournemouth might have a billionaire owner, which rather dilutes their achievement of promotion to the Premier League anyway, but 12,000 home gates and financial fair play will ensure they barely win a game next season. The likes of Callum Wilson and Harry Arter won’t be able to con leading referees like Michael Oliver for a start. Watford are also doomed. They’ve struggled against the top sides in the Championship all season so the likes of Chelsea, Spurs and even Liverpool are hardly likely to be bothered by trips to Vicarage Road, as long as they can find a parking spot. Do Norwich City fans really think they have a chance of survival in the top flight with Cameron Jerome spear-heading their attack? Ipswich are even worse off and Brentford are managed by a bloke who won’t even be at Griffin Park next season. It’s still possible last season’s top three in the Championship will be back in the second tier next season. That’s because the Championship is mediocre. Interest is only sustained to see who the whipping boys will be the following season. Sadly the gap between the Championship and League One is also increasing. 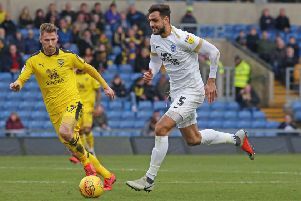 Clubs the size of Bristol City, Preston and Sheffield United have the fanbase and financial clout to survive at Championship level, but the likes of Posh, MK Dons and Swindon will always find it hard. Virtually the entire Championship is awash with either parachute payment money or the remnants of massive TV deals. That in-built financial advantage would be impossible for Posh to bridge unless they can find another ‘Holy Trinity’ in non-league football.